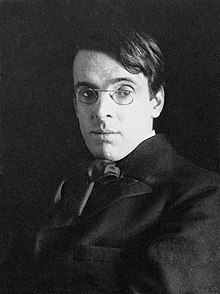 Gulielmus Butler Yeats (natus Sandymount in vico apud Eblanam die 13 Iunii 1865; mortuus Roccae Brunae in Francia die 28 Ianuarii 1939) fuit poeta et ludorum scaenicorum scriptor Hibernicus, unus e maximis hominibus litterarum saeculi vicensimi inspiratus a symbolismo, modernismo, mystica, astrologia, et scaena Noh. Anno 1923 Praemium Nobelianum Litteraturae accepit. Brown, Terence. 2001. The Life of W. B. Yeats. Blackwell Publishers. ISBN 0631182985. Ellmann, Richard. 1978. Yeats: The Man and the Masks. W. W. Norton. ISBN 0393075222. Foster, R. F. 1997. W. B. Yeats: A Life, Vol. I: The Apprentice Mage. Novi Eboraci: Oxford University Press. ISBN 0192880853. Foster, R. F. 2003. The Arch-Poet 1915–1939. W. B. Yeats: A Life, 2. Novi Eboraci: Oxford University Press. ISBN 0198184654. Hone, Joseph. 1943. 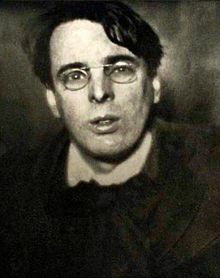 W. B. Yeats, 1865–1939. Novi Eboraci: Macmillan. OCLC 35607726. Jeffares, A. Norman. 1949. W. B. Yeats: Man and Poet. Yale UP. ISBN 0312158149. Jeffares, A. Norman. 1989. W. B. Yeats: A New Biography. Farrar, Straus and Giroux. ISBN 0374285888. McCormack, W. J. 2005. Blood Kindred: The Politics of W. B. Yeats and His Death. Pimilico. ISBN 0712665145. Pritchard, William H. 1972. W. B. Yeats: A Critical Anthology. Penguin. ISBN 0140807918. Jeffares, A. Norman. 1984. A New Commentary on the Poems of W. B. Yeats. Stanford University Press. ISBN 0804712212. Longenbach, James. 1988. Stone Cottage: Pound, Yeats, and Modernism. Novi Eboraci: Oxford University Press. ISBN 0195066626. Vendler, Helen. 2004. Poets Thinking: Pope, Whitman, Dickinson, Yeats. Cantabrigiae Massachusettensium: Harvard University Press. Vendler, Helen. 2007. Our Secret Discipline: Yeats and Lyric Form. Cantabrigiae Massachusettensium: Harvard University Press. Cleeve, Brian. 1972. W. B. Yeats and the Designing of Ireland's Coinage. Novi Eboraci: Dolmen Press. ISBN 0851052215. Igoe, Vivien. 1994. A Literary Guide to Dublin. Londinii: Methuen Publishing. ISBN 0413691209. King, Francis. 1989. Modern Ritual Magic: The Rise of Western Occultism. ISBN 1853270326. Ryan, Philip B. 1998. The Lost Theatres of Dublin. Wiltshire: The Badger Press. ISBN 0952607611. Vicimedia Communia plura habent quae ad Gulielmum Butler Yeats spectant. Vide Gulielmus Butler Yeats apud Vicifontem. Novissima mutatio die 16 Iunii 2018 hora 17:27 facta.